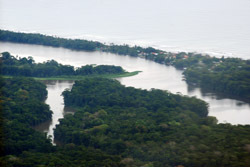 Tortuguero means "land of turtles" and is true to its name. The nearby Tortuguero National Park and is a key nesting site for the world's most endangered turtle species. The Cano Palma Biologival Research Station and the John H. Phipps Biological Field Station are located the area and they concentrate on research and conservation, particularly the turtles. The culture on the caribbean side of Costa Rica is quite different from the rest of the country. There is a strong Afro-Caribbean influence. No roads lead to Tortuguero — plan on arriving via boat from Moin, near the port of Limon or via plane into Tortuguero Airport. There are guide tours to see the turtles lay eggs and hatch. You can also rent canoes and kayaks to explore the canals or take guided tours. See caimans and crocodiles on these adventures. Sport fishing, zip lines and bird-watching is popular in the area.